This posting came from a blog post by C-CAP (Careers through Culinary Arts Program). Our young and dapper assistant wine director, Carlton McCoy, received a scholarship from the organization which allowed him to pursue an education in the culinary arts. It was a sultry summer evening in the mountains of Colorado. The Aspen Food and Wine Classic was in full swing, and anybody who is anybody in the upper echelon of the culinary world was drinking and dining at The Little Nell. Every person there seemed to belong there, as if he or she was part of the fabric in this Relais & Châteaux hotel. While sitting and listening to the elegant chatter, I watched a well-dressed gentleman float around the tables, smiling and making small talk. 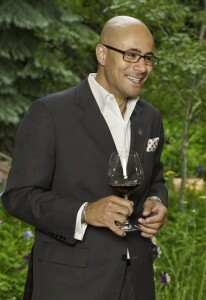 This elegant man was Carlton McCoy, the sommelier at The Little Nell. He carried himself with such grace and confidence, yet he put everyone at ease with his relaxed gaze and soft speech. When he approached our table, we talked about the menu and delicious wine pairings, and he recommended a French wine named Cornas. Under the tutelage of C-CAP Founder and Chairman Richard Grausman, Chef Ian Barthley, Chef Marcus Samuelsson, Sommelier Andrew Myers and C-CAP D.C. Coordinator Troy Williams, Carlton took a leisure pastime of helping his grandmother with her catering business and made it into a successful career. He credits his success with the aforementioned individuals, and he recognizes that while he’s on the road to success, he makes it a point to continue to seek them out as mentors. Carlton recently corresponded with Richard Grausman, sharing that he had passed two out of the three parts of the Master Sommelier Exam on his first attempt—the blind tasting and the theory portions of the exam. Note: it is a rarity to pass these two parts on the first attempt. He will go on to take the third part of the exam next year. If he passes, he will become a Master Sommelier.